This gift comes arranged in a lovely wire basket for the perfect presentation. 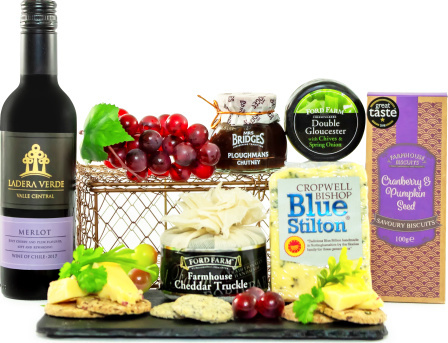 We have paired this rich bottle of Merlot with delicious cheese, chutney, biscuits, and everything you need to enjoy your very own cheese and wine feast! Treat somebody special to a memorable gift when you send this delicious wine and cheese selection.